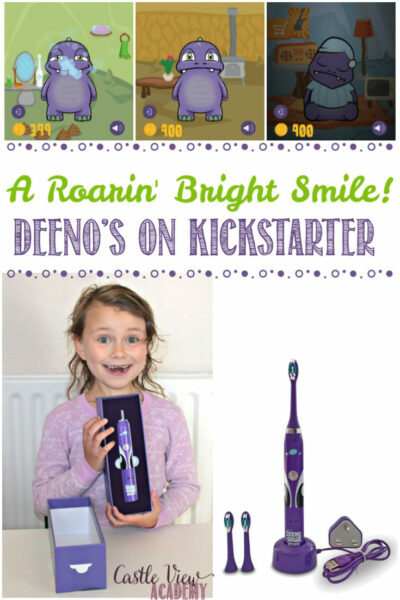 Home » Education » Health » Give Your Children a Roarin’ Bright Smile – Deeno’s On Kickstarter! Give Your Children a Roarin’ Bright Smile – Deeno’s On Kickstarter! We all know that children don’t brush their teeth as well as they should, no matter how much us parents remind and nag them to do it. 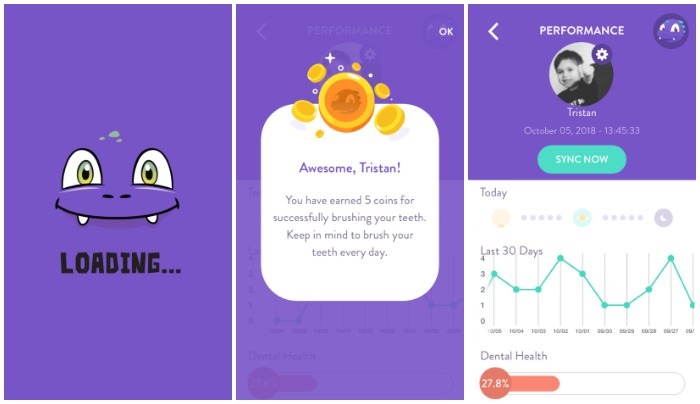 My children’s smiles have brightened and my need to nag has lightened over the past couple of months as they’ve been using Deeno-Saur toothbrushes! 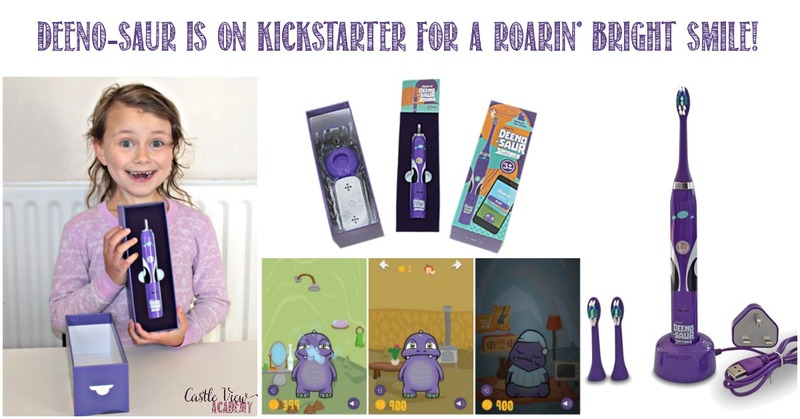 Read on to discover more and to learn about their Kickstarter campaign. With 60-90% of the world’s children having tooth decay, we as parents need to do as much as we can to bring that statistic down. In the UK, 24% of 5-year-olds have tooth decay with an average of 3-4 teeth needing filled or extracted. That’s really shocking! Instilling good oral hygiene is paramount in these early years or the future will be bleak. 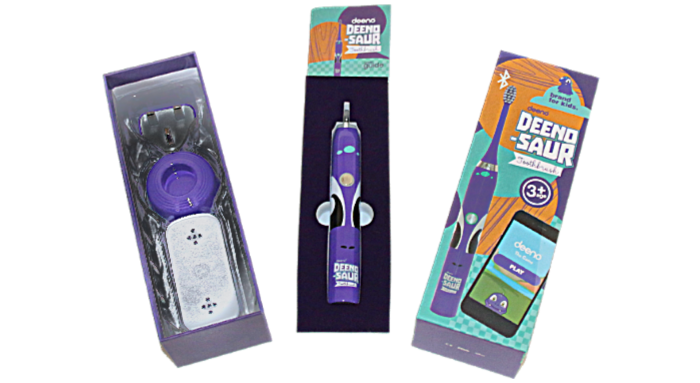 Deeno asked us if we would like to be a part of their beta-testing team and kindly sent each of my children a Deeno-Saur rechargable electronic toothbrush in August. It was the first time they’d experienced using an electronic toothbrush. Previously, I was the only family member to have the extra-clean feel of a motorised brush experience. When their brushes arrived, they could hardly wait to open them! Inside each box was a purple Deeno-Saur toothbrush. 2 brush heads, a travel case to contain the heads, and a charging base that can either be plugged into a regular socket, or use the USB charging option. 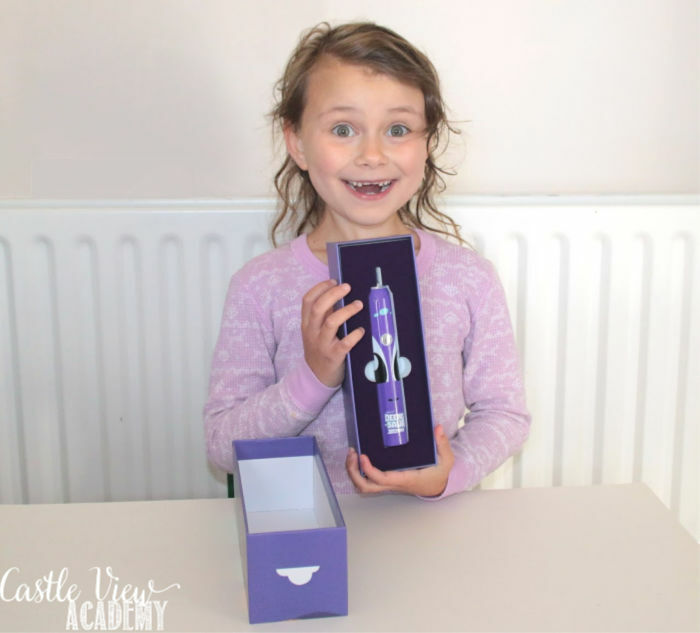 After an initial charge of the brushes for 24 hours (a charge lasts up to three weeks when used twice a day for two minutes), the kids were ready to go; just press the button and brush! I should note that the charging station is super kid-friendly as all you have to do is set the brush in the base in any direction and it will charge. Before I even get into tracking or games, I wanted to let you know that with Tristan, especially, there was a visually noticeable difference in his teeth after just a few days using this brush over his usual manual brush. He would go through toothbrushes like nobody’s business, with splayed bristles and fuzzy teeth even after brushing for 2 minutes twice a day, as well as flossing. With the Deeno-Saur his brush head has lasted for over two months already in great condition, and his teeth are actually whiter and non-fuzzy! That’s amazing!! When they’re done brushing, Tristan heads over to my smart phone and syncs his brush with the free downloadable app. This app can track how many times he’s brushed for the full 2 minutes and awards him 5 coins for each successful brush. 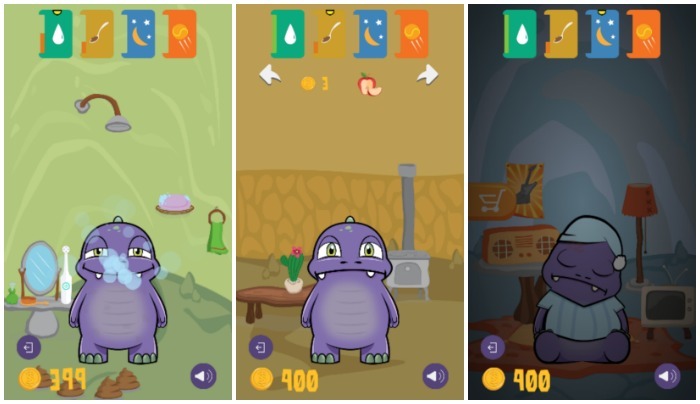 Then for added fun, there are games that can be played where kids interact with Deeno; for example, points are spent to buy Deeno food and points are earned by cleaning Deeno. And there are some additional fun games…the lumberjack is quite addictive, if I do say so myself (of course, I had to try it out for research purposes)! 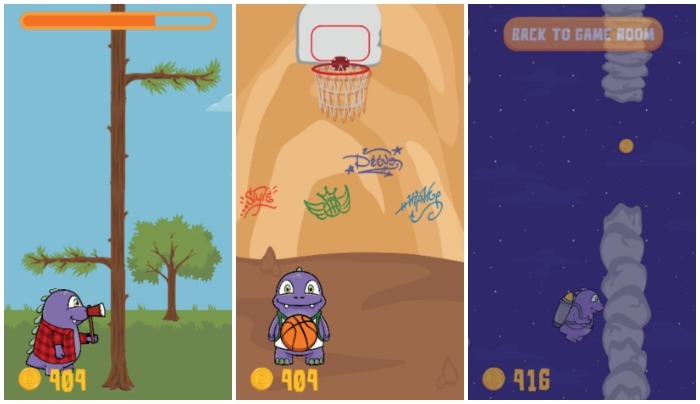 Why not try to shoot some hoops or jet into space, too. Although up to 6 children’s profiles should be able to be set up under one app, I was only able to get one brush to sync to the app. As a work-around, Kallista syncs her brush with Phil’s phone, but that means she is only able to do this once a day, rather than 2 or 3 times. About a third of the time Tristan’s brush wouldn’t correctly sync. Either he wouldn’t receive the bonus 5 coins and/or the app wouldn’t show his brush on the graph. Occasionally, during the next sync, the graph would jump up one or two brushings. So head on over right now as there are some spectacular deals on the campaign that you don’t want to miss out on! Lock your pledge in now and save over purchasing the Deeno-Saur in the shops in the near future! If you’d like to know more or would like to follow Deeno, you can connect with them through their website, Facebook, Twitter, and YouTube.